The Farm is where you (the Hero) lives and spends most of his day. You tend to your animals, crops, and house here. This is also where you sleep every night. 1. Secret Garden: After eating a Power Berry, a flower will grow in this garden. The more Power Berries you eat, the more flowers grow and the happier you become. 2. Your House: This is your house, the place in which you live. You sleep here, find out tomorrow's weather, and things of that sort. You can upgrade your house two times. 3. 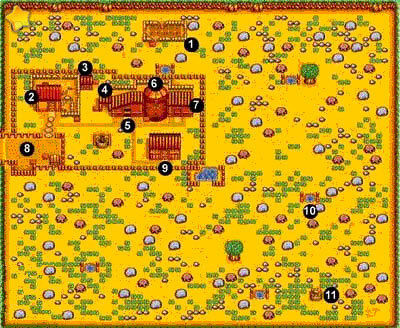 Wood Shed: This is the location in which all of the tree stumps you chop up throughout the game is stored. 4. Horse Stable: Your horse will sleep here at night after you receive it. 5. Cow Stable: This is where all your Cows sleep at night and eat their meals. This stable has a capacity of 12 Cows. During the day you can let them out into the field. 6. Silo: After you cut the pasture grass you have grown on your farm, the Fodder will be stored inside the Silo. 7. Chicken Coop: This is where all of your Chickens live. Feed them here, ship their Eggs, and incubate more Chickens to hatch. There is a maximum capacity of 12 Chickens. 8. Shipping Bin: All of your produce can be placed in this bin, and every night at 5:00 PM the Shipper will stop by and give you cash for your produce. There is a Shipping Bin just like this one in the Cow Stable and in the Chicken Coop. 9. Tool Shed: This is where all of your Tools are stored when you are not carrying them. You may only carry two items at a time. 10. Water Holes: These are used to refill your Watering Can when it runs dry. You can also throw rocks into the Watering Hole instead of smashing them with a Hammer. 11. Secret Well: When the Earthquake occurs during the Summer this Well will open up.